Nemours Children's Hospital's 3D modeling provides a realistic view of pediatric anatomy. When you think about kids and models, you envision planes or trains scaled down to a fraction of their actual size. At Nemours Children's Hospital in Orlando, radiology technologists and radiologists are also making the connection between children and smaller-sized re-creations by making 3D medical models of their tumors and damaged vital organs, taking radiologic images from the screen to the palm of the hand. "The idea for this program started with an idea from our advanced imaging lab, for use with complex cases of patients with orthopedic and spinal issues," says Craig Johnson, DO, department chair of medical imaging at Nemours. "At the same time this work was getting underway, Best Buy was starting to sell 3D printers. We thought, 'Wouldn't it be nice if we could see what we were dealing with regarding our patients' conditions before surgery and not just looking at images of the problem?'" With this technology, Nemours developed an in-house program that goes from image acquisition to software processing to printing to holding a replica of the disease at a patient's bedside. The program gives interventional radiologists and surgeons a unique opportunity to view a tumor or part of the anatomy, show patients and their families what the area of concern looks like, and provide a multidisciplinary team with a preplanning blueprint and topographic roadmap to use when considering surgical options in cases of cancer or cardiac surgery. 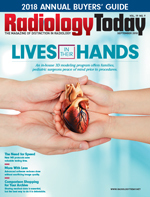 "Having 3D models increases confidence, reduces procedure times, and minimizes unexpected findings while in the operating room," Johnson says. "Doctors can perform procedure simulations using the 3D models, which helps prepare the patient's clinical team for what they need to do to provide this patient the best quality of care." The software, officially named Materialise Mimics InPrint 2.0, is the only FDA-approved segmentation software designed for medical 3D modeling. The software segments structures in 3D medical imaging. Models are built from volumetric 2D CT, MRI, and echo images, along with input from physicians involved in the case. Images are used to design anatomically correct, true-to-size, 3D models of organs, tumors, and even bones. "It's easier for everyone involved to see the problems with 3D models than with 2D images," Johnson says. "Radiologists are the masters at looking at 2D images, then imagining the area imaged in 3D and getting an accurate image in their heads of what they're looking at. Other clinicians aren't always able to do that." When it comes to building the models, Johnson says clinicians start with base data on the patient and DICOM files. They then look for input from all the "anatomical specialists" involved—radiologists, interventional radiologists, surgeons—everyone who is a part of the patient's care. "It's a team effort," he says. "For example, when taking CT images, the patient can be positioned on the table in a way the surgery will be performed to suit the needs of everyone involved in the case." A key member of the 3D modeling team at Nemours is Pushpak Patel, a radiology technologist who began working with Johnson on this program two years ago. At that time, they were treating oncology patients, creating models that showed the size and location of tumors within the anatomy. As the process has evolved, so too have the capabilities of this technology. "We can add information as we go throughout the process, customizing the information to be sent to the 3D printer," Patel says. "We can even go back and create models from old images." Johnson says once the image and data are prepared, the information is sent to the 3D printer. The final product typically takes about 24 hours to produce. After postprocessing with tiny instruments, magnets, and adhesive, the model then begins to serve its purpose as a surgical prep guide and educational tool for patients and families. "When you hand a 3D model to the surgeon, you can see a lightbulb go on," Johnson says. "They may rethink their approach to surgery based on what they see in the model." Johnson talks about the level of confidence he sees in surgeons after they obtain the 3D model. "You get the whole picture when you see everyone at a tumor board review the model and discuss details of the case," Johnson says. "When you talk to the surgeons, you can hear their confidence increase after reviewing the model." The realism of the model not only helps surgeons in their planning but also gives patients' family members a visual image of their child's tumor, organ, or vascular issue. Clinical professionals who are more accustomed to reading radiologic images can navigate the black and white pixels in a CT scan or MRI. To laypeople, however, the subtle nuances on the screen don't tell the story in the same way as a 3D model can. Nemours' 3D models have proven invaluable for educating patients and families. Johnson says models can help ease parents' concerns about their child's treatment. They get an up-close look at the medical situation and can gain a better understanding of their child's condition and treatment plan, better than with a 2D image or even 3D images. "Parents don't have a radiology background, so when we show them a CT or MRI image, they don't always understand what they're seeing," Patel says. "When we show parents a model of their child's anatomy, however, they can see the tumor or other problem as it appears in the body. It helps them understand so much about their child's condition." Patel tells the story of a child who had a lung tumor. The child's parents visited numerous hospitals while seeking the best options for his care. He says they chose Nemours because they could see a model of their son's tumor and perceived a higher level of technology and care. Johnson says that families visit various tertiary care facilities when they have a sick child. They hear about treatment options and base their decisions on scenarios and potential outcomes. He says that Nemours can do more than just talk to families about their child's care. "We can show parents a model of a child's heart and show them what needs to be done to repair their child's congenital defect," he says. "We can give parents a better understanding of what's happening with their child. You can show parents an image of their child's heart defect or tumor, and they'll say they understand. But, when you show them their child's tumor in a ribcage, and they can hold that in their hands, they get it." Older children have a greater understanding as well, as some even have experience creating 3D models. "I've talked to some kids who say they are members of their schools' 3D club," he says. "They get it better than the adults." It would have been easy to contract outside the hospital for 3D modeling. However, Johnson wasn't comfortable with the lack of control with that method, nor with the time involved in obtaining a final model. "Establishing an in-house 3D modeling program requires more money on the front end, but it's more costly to send images out to have the model created," he says. "You also can't oversee the model creation or control the steps involved. It also takes more time to have the model created outside the hospital." Children and their small anatomies are perfect candidates for 3D modeling. In the case of the child with the lung tumor, being able to re-create what it looks like inside a tiny chest cavity is difficult to do with images alone. "Scans all look the same, and everything is so close together," Patel says. "When you're dealing with a 2-year-old child, everything's so small that things can look similar. The surgeon knows that the organs are small, but it's helpful for everyone involved to see a model of how small the anatomy really is. That reduces surprises during surgery." Johnson says 3D modeling is a natural fit for pediatric patients who have hearts the size of walnuts or need microcatheters as part of their treatment. "Knowing where to make an incision is even more important to determine in advance on a patient with a smaller anatomy than that of an adult," Johnson says. When thinking about which patients could benefit from 3D modeling, Johnson says patient needs and the urgency of their condition are the top considerations. "One-third to one-half of our patients has a more urgent need for surgery, so that increases the need for a model in a timely manner," Johnson says. "When the model is for use in a tumor board setting, the sense of urgency isn't as great. There's more of a thought process involved." Nemours Pediatric General and Thoracic Surgeon Tamarah Westmoreland, MD, PhD, says there are cases where images are enough, especially when the surgeon is experienced; however, the depth added by using 3D models is "hard to replace." "When it comes to tumor visualization, you can't appreciate the intimate nature of the structure without 3D modeling," she says. "It's also hard to replace 3D modeling when it comes to educating patients and families." Johnson consulted with Westmoreland to determine benefits of 3D models over images in surgical preparation. "Three-dimensional modeling prepares us by helping us know exactly what we're going to do," Westmoreland says. "We do not have to plan on the spot if we come across something unexpected. Instead, we've had imaging from radiology as well and the model. It is rehearsed, planned, and then executed without complication." One example where 3D modeling was helpful for the surgeon was a case where a child had a large vascular mass in the retroperitoneum, with significant blood supply, located near the ureter. Consulting with Johnson, Westmoreland found that the model would be the best way to visualize the situation and come up with a solution. "Dr. Johnson would embolize the blood vessels but needed to see the exact location of the ureter," she says. "He could damage the ureter when dissecting the tumor. The 3D model was helpful in seeing where to cut, to make the case safe for the patient. The patient made a full recovery and is back to normal activity." She says in this case, the 3D model was helpful with not only surgery planning but also in showing the family what was wrong and what would occur during surgery to deal with the vascular mass. In a world before 3D modeling, Westmoreland would spend her surgical prep time with radiologists, looking at CT scans and other images. Her next steps were in her head and required some artistic license. "I would look at the imaging and imagine in my mind what the anatomy looks like in 3D," she says. "Then I would draw the patient's anatomy and share that drawing with the patient and their family." Having the 3D model helps Westmoreland establish a partnership with the family, by being able to show them what's happening with their child and then see the family gain an understanding of the situation. "Informed consent should really be informed consent," she says. "You can show them images, but it's different when you can show them the situation in 3D. Three-dimensional modeling fills the gap between images and reality." Lack of reimbursement remains a negative in the use of 3D modeling. The technology is expensive, and, without coverage, Nemours assumes all the cost. Manpower and the time involved can be negative factors as well, Johnson adds. When it comes to treating young patients, however, there is an emotional level of care that goes beyond costs and the logistics of planning surgery for small-sized anatomies. Westmoreland points to the role medical modeling plays in easing parents' minds. "The family trusts you to operate on their child," she says. "You need to deliver their child back to them fully intact and with the tumor gone. Three-dimensional modeling helps surgeons share their knowledge and gain parents' trust."